A one page handwritten letter from J.R.R. Tolkien to Mr. Terence Tiller (BBC Producer) on 19 September 1956. Autographed, (full signature & initialed) 1 page (front only) hand written letter to Mr. Tiller. Terence Rogers Tiller (September 19, 1916-December 24, 1987) was an English poet and radio producer. In 1955 he was producer of the first BBC radio adaptation of Tolkien's The Lord of the Rings for the BBC. The first part of the story, The Fellowship of the Ring, was broadcast in six episodes in 1955. The final two volumes, The Two Towers and The Return of the King were covered in six episodes broadcast in 1956. Both series of broadcasts were adapted and produced by Terence Tiller, who corresponded with Tolkien for advice concerning the second series. Two letters have been reproduced in The letters of J.R.R. Tolkien. 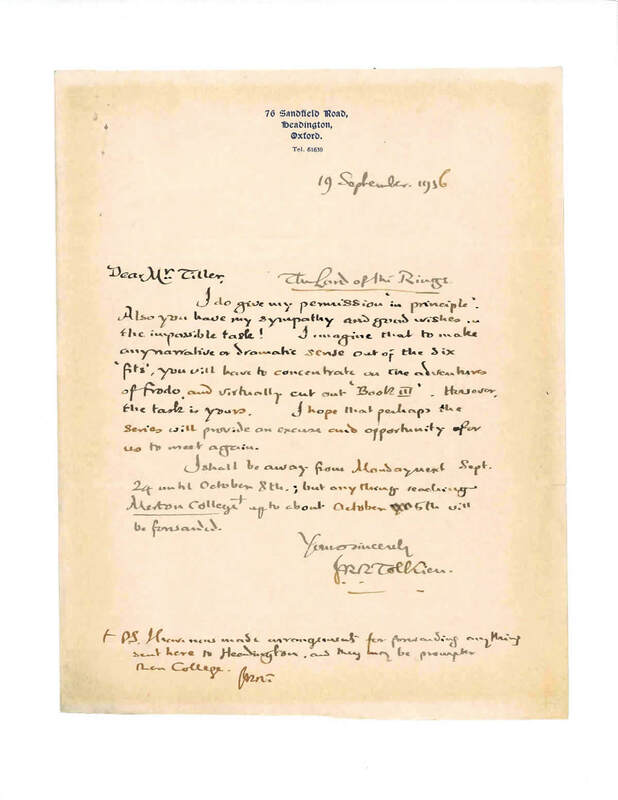 This letter is after the first part of the episode was broadcast (November to December 1955) and where Tolkien gives permission to Mr. Tiller to start working on the next two adaptations. I do give my permission 'in principle'. Also you have my sympathy and good wishes in the impossible task! I imagine that to make any narrative or dramatic sense out of the six ‘fits’, you will have to concentrate on the adventures of Frodo, and virtually cut out ‘Book III’. However, the task is yours. I hope that perhaps the series will provide an excuse and opportunity for us to meet again. I shall be away from Monday next Sept. 24 until October 8th; but anything reaching Merton College up to about October 5th will be forwarded. A unique piece of history in the adaptation of J.R.R. Tolkien's Lord of the Rings to other media.